The ECHO 9 series is available in 4 models to suit every budget and application. Includes all the features of the ECHO 9 plus a live color waveform (A-scan). (No Datalogger) with the live waveform, you can adjust range, gain, blanks and rectification. ECHO 9W also includes the ability to display the thickness of the coating and the substrate thicknesses at the same time as well as the ability to calibrate on their individual sound velocities. Combines all the features such as Hand-Held Digital Ultrasonic thickness gage with live Color Waveform, “unlimited” thickness readings via internal Datalogger with removable micro sd card including: Plastic Carrying Case (PC-09) , 2 Oz. bottle of couplant (C-02G), Rechargeable Li Ion Battery, Instruction manual and DKS537, 5MHz, .375 " diameter Transducer with potted cable, Echo to Echo, and B-Scan, A Custom Rubber boot with built in bail and 4 point chest harness, Charger adapter with usb cable and Data XL interface program to export saved readings to p.c. (excel). The ECHO 9DLW also includes the ability to display the thickness of the coating and the substrate thicknesses at the same time as well as the ability to calibrate on their individual sound velocities. Measurement Rate: 4 Hz or 25 Hz. Fast Min/Max: Displays minimum, maximum or both simultaneously with actual thickness at 25 Hz. This option allows for the coating or paint thickness to be ignored. The coating thickness or paint does not add any structural integrity to the base material. Without the ability to subtract the paint, the normal measurement would introduce an error of 2 to 2.5 times the thickness of the paint, which represents the sound speed difference from Paint to Steel. In addition it is expensive and time consuming to grind out the coating thickness and to re-apply a coating. This option is only available combined with the Datalogger option. Provides a non-encoded (time base) or a cross section (side view) of the part being inspected. The A-scan and B-scan can now be view at the same time. The operator can scroll where the cursor line is after a B-scan is generated. Requires hardware modification to either ECHO 9DLW or ECHO 9DL, uses EZ Scan 6 as a magnetic wheel, linear axis encoder. The EZ Scan 6 combined with our ECHO 9DLW is the ultimate in easy to use, affordable magnetic wheel linear axis encoder for B-scan surveys with reports. The EZ Scan 4 sends a pulse to the gage to take a thickness reading while drawing the B-scan image based on one axis. The gage keeps track of the distance traveled (DT) so you can cross reference any wall thinning areas to the image displayed and saved into memory. To show A-scans and B-scans on the computer, you must purchase separately our Data XL Pro. The ECHO 9 Datalogger stores millions of readings to its removable sd card as linear, 2D, 3D or boiler in alpha numeric or thousands of waveforms (if gage is equipped with waveform option). Thickness values along with the i.d. information and all gage set up parameters are exported to Microsoft excel via the no-charged, included Data XL interface program provided with every Danatronics thickness gage. Our Datalogger also interfaces with Ultrapipe. Please contact Danatronics for more details. The live waveform (A-scan) is used to verify reading stability. With the live waveform the operator can adjust gain, range, rectification and 2 forms of blanking to set the gage to ignore unwanted noise or mode converted echoes. When equipped with the oxide scale option and 20mhz delay line transducer, both ECHO 7 and ECHO 8 units with live waveform can measure the oxide scale (0.015"-0.040") and tube thickness calibrated to their independent sound speeds. Displays trig functions for angular distance, surface and depth. Can use 2.25MHz, or 5 Mhz, in angles from 30-80 degrees. NOT TO BE USED AS A FLAW DETECTOR due to limited scan speed and vertical linearity requirements of most flaw detectors. The spring loaded holder (SPH-718) is the ideal fixture to be used on small diameter applications such as tubing to prevent the probe from rocking. Shown above is the SPH-718 with the DK718 transducer inside. The probe can be rotated as well and the fixture has v-notches to assist in probe alignment. 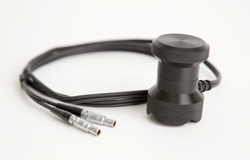 Available magnetic pipe holder that screws onto the Â¼, 20 connector on the ECHO 9. This is ideal to stabilizing the ECHO 9 on a larger pipe or any magnetic surface and can even be used up side down. We offer a custom protective rubber booth with built in bail, 4 point chest harness and unique 2 finger hold strap. The EHC-09 Transport Case is shown with common inclusions. (Spare batteries and 5 step test block sold separately). We offer a variety of ultrasonic couplants from a standard gel in 2 Oz. or 12 Oz. options, to high temperature up to 1100 Degrees F. Contact us for more details. ECHO 9 series comes with a convenient AC charger via the USB port so you do not have to replace the batteries on a regular basis. 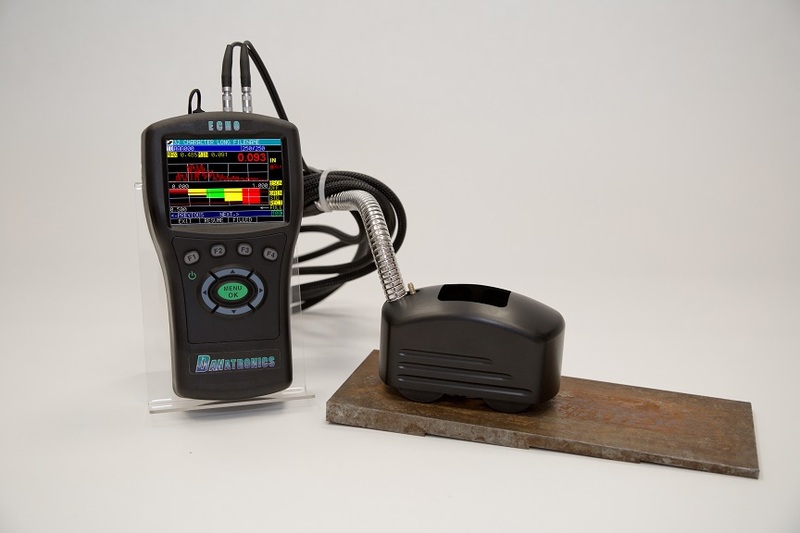 With this hardware option the operator can use a footswitch to save, freeze or send readings. 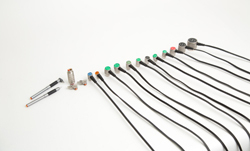 Danatronics offers a wide variety of dual transducers from .5-10 Mhz , high temperature duals and delay lines including pencil probes (12 Mhz.) for special applications. Consult Danatronics or one of our authorized representative for the proper use and recommendation for your application.